It was a recent visit to the Republic of Kiribati, setting for Grimble's wonderful stories of A Pattern of Islands and Return to the Islands, that stirred memories. Not only had Grimble and later Eric Bevington in his book The Things they do for England if only England knew showed how isolated life was on these islands but they also revealed how medical emergencies could lead to trying circumstances. Even if radio communication was available the possibility of a ship being close to effect a rescue was rare. Before radio it was not even possible to obtain encouragement or advice from a doctor. Gazing across the lagoon at Abemama and trying to imagine myself in such a situation I suddenly remembered an incident while visiting the Santa Cruz islands in the British Solomon Islands Protectorate. Unlike some places the Eastern District did have a ship, plus radios, plus an Assistant Medical Practitioner. The schedule for touring the Santa Cruz islands 250 sea miles to the east of district headquarters was a tour in April and another in November. That way you hoped to avoid the cyclonic season and the stronger SE winds in the period June to September. On this particular trip the tour was delayed until late May - possibly due to the late arrival of Margery, a sixty feet single engine vessel after an overhaul. There was already a load of 25 deck passengers returning home when the ship reached Kira Kira bay and we added a few more including Mike Russell the Agricultural Officer, Francis Kikolo the Assistant Medical Officer, and myself. As the anchor was weighed I leant over the rail talking to Francis and complained about a stomach ache. He assured me in the best medical terms that it would soon pass - possibly tension he suggested. I was inclined to agree with him as the departure had been the usual frantic rush to ensure that the station would look after itself, that the mail had been loaded, the payment vouchers and the cash imprest, the necessary files, the bank forms, were on board. A last look through the mail from the Secretariat in case there was some urgent request. Audit queries were not even opened. Then a check on personal matters such that Margie and the children were going to be comfortable during the next month. Some thirty hours after leaving Kira Kira the ship entered Gracioza Bay on Ndende where some passengers and cargo were unloaded. Then it was a short night voyage across to the Reef Islands where Mike and I were to go ashore. 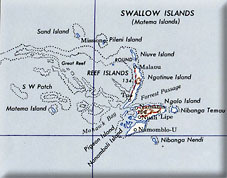 Francis would take the ship to Vanikoro 120 sea miles to the SE to deal with some medical problems among the timber workers, some of whom were from Australia. He decided to take the Reef Island medical assistant and the nurse for on job-training. He calculated that he would be returning within a week, by which time we would have completed our work on the Reefs. 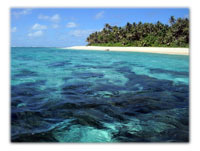 The Reef Islands consist of a coral atoll raised on the eastern section to some three or more metres above the sea with the major lagoon stretching thirty kilometres to the west. Here it is possible for ships to anchor for protection from the SE trade winds as long as they can thread their way through the reefs to anchor off the large island of Fenualoa. 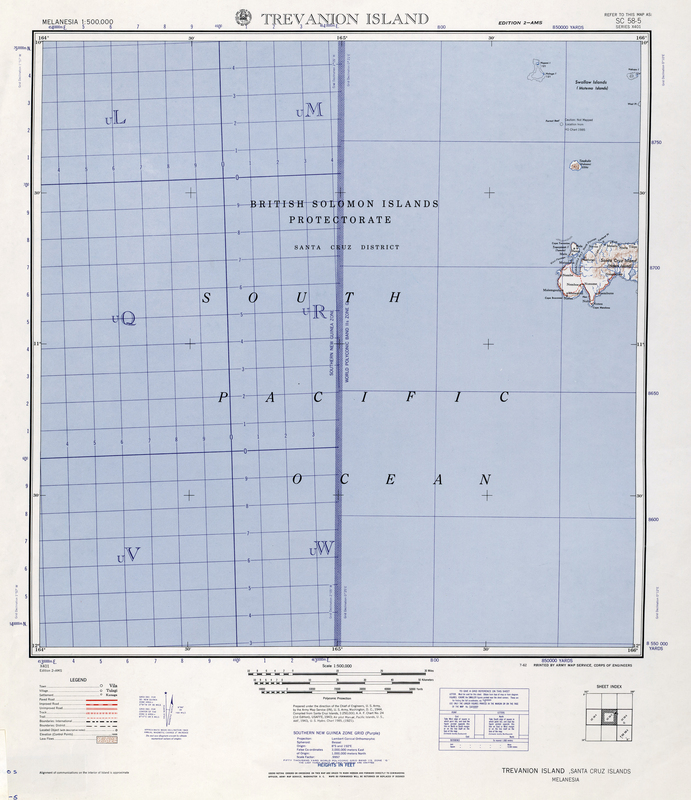 This is 10 kilometres long and only .5 kilometre wide and it is separated from the other islands by a narrow but very deep channel through which the swell moves. 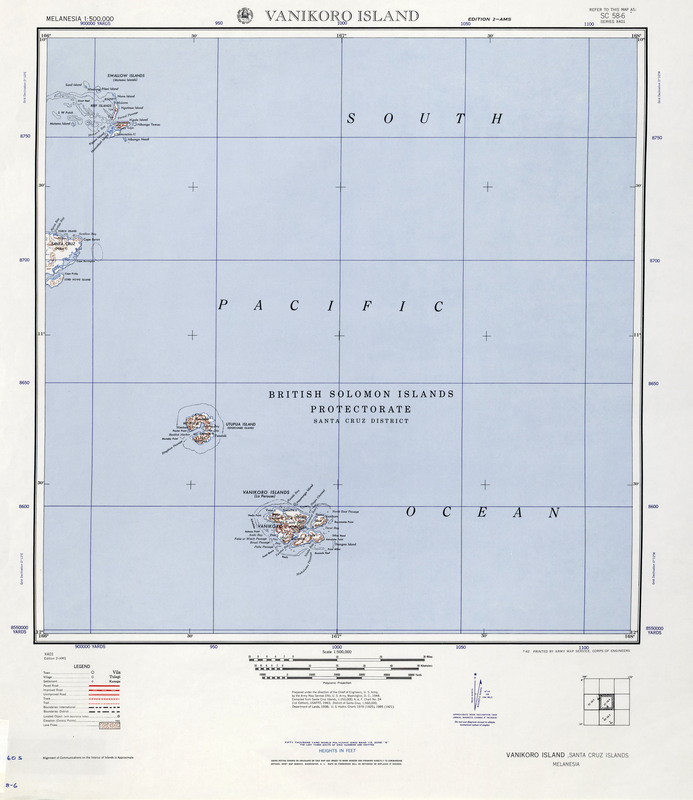 Then on the eastern section there are a host of islands ranging from tiny half hectare to larger ones of over one hundred hectares but all connected by shallow water which at low tide has to be waded through to move from island to island. The population is dense and the whole of the islands are a veritable garden of coconuts, breadfruit in season, yams and other vegetables and fruit. After a battle with Treasury a grant of fifty dollars had been given the district to erect a rest house on a tiny island off Ngadeli; far enough said the headman for visiting officers not to be "in the hair" of the villages. The owner of the island had the contract to erect the three metre by three metre house, and a small shelter over a fireplace formed the kitchen. It was not the height of luxury but it seemed that way after the smelly cramped ship - and it remained level all the time. It had been a battle to obtain this small grant from Treasury but it was pointed out that the ship could go off on other duties, and that being on shore we had more contact with the people and were able to be more efficient. This then was the setting and though the island and the position of the house was idyllic I was not comfortable being doubled over with my stomach ache. Mike was quite cheery and said it would soon pass but I wasn't so sanguine. Next day the pain had localised to my right side and I announced "appendicitis" and I was going to lie very still and eat nothing and drink water for the next twenty four hours. I suggested to Mike he take a trip across to the medical clinic an hour or so across the sand flats to another island, and see what may be in the cupboard to deal with this problem of mine. He returned in the afternoon to inform me that there was no anaesthetic, one rusty scalpel, some aspirin and a fungicide for a common skin complaint. Mike said, I think as an aside, that he was quite a whiz at dissection in his biology classes. I decided I was not that sick and we would wait for another day and then assess the situation. Naturally I applied a lot of willpower during the following days to see whether I may be a faith healer. Certainly I felt a little easier next day but I did not move off my sleeping mat, uncomfortable though it had become and continued to drink the very unpalatable well water which was very salty but made even worse-tasting tea. Mike went off to count coconuts and talk copra drying to some nearby villagers. About 1100 hours the next morning the cry went up "sail ho" and several villagers arrived to point out a ship in full sail coming up from the SE. As it sailed nearer I struggled out to look and recognised the Yankee which every two years sailed around the world with a crew of rich young Americans. "It will have a doctor, Mike", I said, "so you better grab a canoe and see if the doctor will do a house call". As the ship was obviously making to anchor in the western lagoon it was going to take some time for Mike to hopefully return with the doctor. Some time after three o'clock I heard the approach of people and Mike introduced me to the doctor. She was very young but full of confidence and I thought that was an advantage as she would remember her course and be up to date on all modern medicines. She climbed the steps into our tiny house, felt my stomach and said "yes it does seem like appendicitis". Then she looked around and said she would not wish to operate here in such "appalling conditions" which rather upset us because as far as we were concerned it was a fine new leaf house still without the "livestock" likely to inhabit an older house. The doctor suggested I was possibly over the worst of the attack so an injection of tetracycline "the new wonder drug" would be the solution. "Roll over and pull down your shorts - this may hurt a little" she said as she rammed a large needle with a large dose of the "wonder drug" into my bottom. There is such a thing as a counter irritant and I completely lost the pain in my stomach. Next day I felt much better but the doctor arrived for another injection and suggested that when the ship returned I make all haste to the Honiara hospital. The very next day the Margery arrived with Francis who was very keen to operate on the spot. Apparently he hadn't done such an operation for some time and thought the practice would be useful. The offer was refused quite politely by me and we rearranged the program. 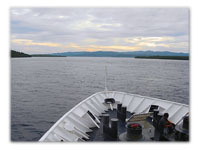 Copra loading was commenced at once and news was sent out that the ship was to return to Honiara. That evening we crossed to Gracioza Bay and took on more cargo and a couple of passengers. By now the SE trade wind was in "full voice" steady twenty knots with rain squalls reaching thirty to forty knots. As we cleared the shelter of the island the full force of the weather hit us. The swell was most impressive and as it was on our quarter we rolled very well indeed. As I was the patient I was in the only bunk, Hans a timber worker with a bad toothache, had the three foot settee and Mike placed a thin mattress on the cabin floor. Under my bunk were several drawers which kept on being thrown out by the ship's motion onto Mike. There was little space to put them elsewhere as the cabin only measured two metres by two and a half metres. Every time we wanted to use the wash basin we had to stand on Mike's head. The cabin was on the after deck which in calm seas was some two metres above the sea. The motion of the ship became more violent and the ports in our cabin had to be screwed tight and the door firmly closed as the seas were breaking against them. Unfortunately none were really water tight and soon Mike's mattress with him on board was not only sliding back and forth across the cabin but he was now afloat in several inches of salt water. We moved the dozen deck passengers who had become very frightened into the tiny galley which was quite a tight fit. Normally one person was a tight fit, but they certainly did not wish to stay on deck any longer. At three that afternoon the Bosun (Captain) Basi, normally and even in this situation a very phlegmatic middle aged man from Guadalcanal, came to tell me that the crew were so frightened they would not take the wheel any longer. The large five foot diameter wheel was kicking so violently that it was taking two men to hold it. He and one crew member said they would "try" to steer the ship. If we had changed course to run with the sea who knows where we would have ended up as no one knew deep sea navigation. Many a canoe had disappeared in similar fashion. The swell was indeed so large that we slid down the slopes and climbed laboriously up the next one only to be hit with four feet of the top being blown back at us. Water had squeezed into every nook and cranny. In a way it was exhilarating but also a bit of a worry. However, all good things come to an end and just before dusk we sighted San Cristobal where it should be and soon after we had its shelter. Shame-faced crew appeared to take over the wheel from the bosun and at midnight we dropped anchor in Kira Kira bay. Mike had rubbed his elbow raw from trying to stop his sliding on the floor. Hans said his toothache had cured itself and the Honiara doctor told me it was too late to operate - "have it done on your next leave".